A radar detector's frequency mixer combines a local oscillator signal with received signals to convert to an intermediate frequency for processing. Mixers are not perfect and leak some of the LO signal to the antenna. 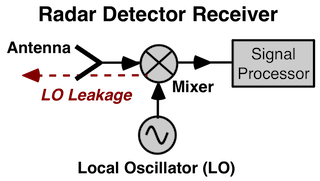 Some radar detectors have a pre-amp or isolator between the mixer and antenna that should reduce LO leakage, but may not eliminate it. The old and unreliable crystal radar X band detectors cannot be detected by radar detector detectors because the they do not have a local oscillator. Some mobile amateur radio transceivers leak signals in the X band that can set off an RDD. Several people operating legal ham radios were wrongfully accused of possessing radar detectors because their radios were detected by an RDD. RDD's also have LO leakage, and some radar detectors are designed to detect this leakage. Police use a Radar Detector Detector (RDD) to enforce radar detector restrictions. RDD's are used in the same manner as a radar detector, point the antenna in the direction of interest. Most RDD's are about the size of a radar detector, some are larger. 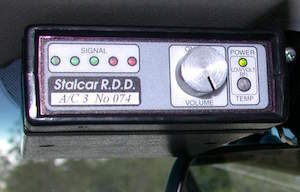 The first Stalcar series was introduced in 2000, and has since gone out of production, but is still in use. The Stalcar was replaced by the Spectre series. The units are about the size of a radar detector with about half a mile range. The receivers use double down conversion superheterodynes, similar to police radar receivers. Additionally, Varactor Tuned Gunn oscillators allow the receiver to sweep a large band of frequencies. Early models sweeped 11 - 15 GHz, later models sweep 10 - 25 GHz. Receiver sensitivity is on the order of a police radar sensitivity, -110 dBm. The VG-2 Interceptor (out of production) was introduced in the 1980s. It has a large antenna and is about the size of half a shoebox. Detection range varies from 1/4 mile to 2 miles. 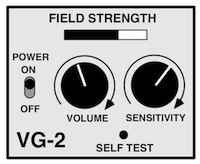 The VG-2 is tuned to receive microwave signals between 11.4 and 11.6 GHz. At one time 11.558 GHz was a universal radar detector LO frequency. Today radar detectors use numerous LO frequencies, some higher end radar detectors are out of the VG-2's band.